The word ‘dagesh’ means emphasis. It is used particularly to denote a dot that is added to letters of printed Hebrew text to add stress. The letter Bet with a dagesh is pronounced Buh and without a dagesh as Vuh. The letter kaf is a kuh sound, and a gutteral chu sound as in Chanuka without a dagesh. Yemenite Jews differentiate between hard and soft Gimels and have a j sound as in giraffe. (An early multilingual Windows based word-processor was developed in Israel some years ago and sold under the brand Accent. The Hebrew-English version was marketed as Dagesh). 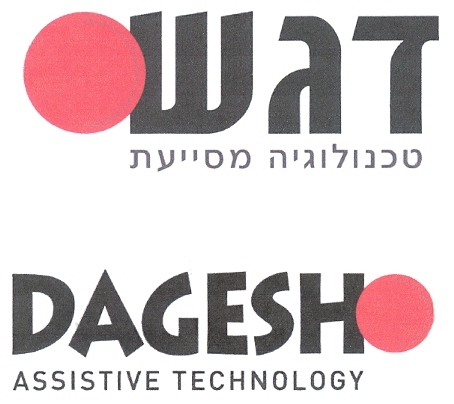 In 2012, Israel trademark application number 243617 was filed for “Dagesh Assistive Technologies”. The mark is shown above. The application covers accessories or equipment intended to improve the functioning and the ability of people with disabilities, namely, computers; arms and mountings; peripheral equipment for computers such as keyboards, keyboard replacements, mice, mouse replacement, joysticks, switches and trackballs; teaching aids; augmentative and alternative communication and computerized communication system, namely, devices intended to improve communication of people with speech disabilities and other disabilities; devices for recording, transmission or restoration of voice; accessible toys and accessible leisure facilities; accessories or equipment intended to improve the functioning and the ability of people with disabilities; all for people with special needs and the population of special education, including people with physical disabilities( e,g with impaired vision or hearing) and/or mental disabilities and/or learning disabilities or developmental difficulties; all included in class 9, sale of computers , peripheral equipment, communication systems and augmentative and alternative communication system (AAC); all included in class 35. Lending of communication systems and augmentative and alternative communication systems (AAC); all included in class 38; training and services for special education students. consulting and adjusting accessibility to population with special needs; all included in class 41 and Lending of computers and peripheral equipment for computes; technical support provided to population with special needs with regard to technical aids and special instrument designated to such population; design and development of computer software in collaboration with para-medical experts for population with special needs; all included in class 42. 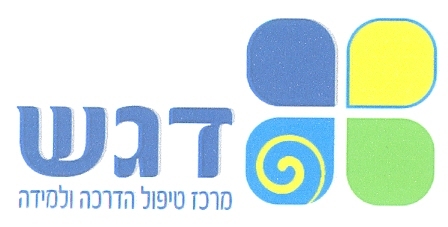 A second Israel trademark application number 260864 for the same mark covers adapted toys for children with special needs and recreation adapted facilities for population with special needs.in class 28, and for Providing treatment and solutions for populations with special needs with motor disabilities with the assistance of measures and paramedical experts: speech therapists; occupational therapists; Physiotherapists; art therapists in class 44. Meanwhile, Rivka Zadick filed Israel trademark application number 243484 for “Dagesh the center for therapy and training” which provides Diagnosis, and treatment of diseases and disorders of physical or cognitive disabilities for children; occupational therapy services; speech therapy, music therapy; art therapy; physical therapy; sport therapy; all included in class 44. The dominant word element in each mark is the word Dagesh. The services provided are somewhat related which results in a similar customer base. Because of the similarities between these co-pending marks, the Israel Trademark Office instituted a competing marks proceeding. However, the parties agreed to co-existence with minor amendments to the list of goods, and requested that the Israel Trademark Office ratify the agreement. Since the marks are stylized and the logos are very different, the adjudicator of Intellectual Property, Ms Shoshani Caspi was happy to allow both marks to register as she did not think that this would create a likelihood of confusion among the public. The three marks have thus progressed to publication for opposition purposes and, unless there are third party oppositions, will be allowed to coexist. In the circumstances, no costs were awarded. RE Israel Trademarks 243617, 260864 and 243484 for Dagesh, coexistence ruling by Ms Shoshani Caspi, 8 February 2015. ‹ IL 157,035 – If one accused of infringing a patent does not challenge its validity, is the accused estoppeled?